The Hideaway, a private sanctuary on a plateau in the hillside, creates a feeling like you have lived on the island of Jost Van Dyke for years and ushers in the idea of never wanting to leave the island adventure you have stumbled upon. The Hideaway is perfect for a small group or family. This recently renovated private compound includes three buildings totaling three bedrooms and two bathrooms. 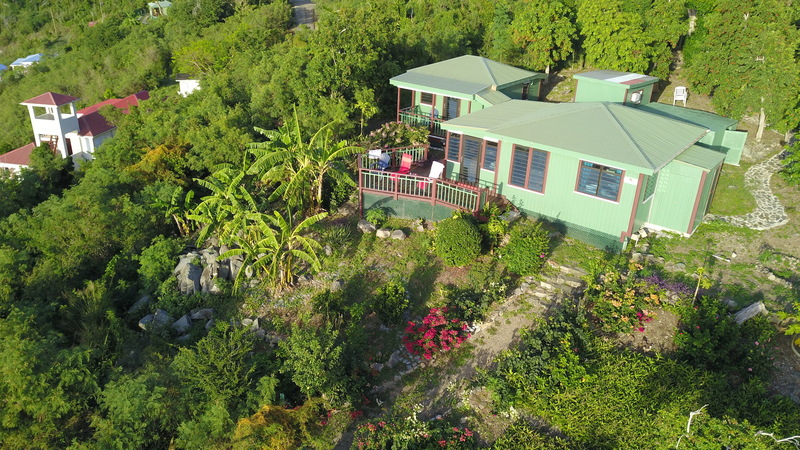 Nestled into the hillside for privacy and extraordinary views of White Bay and St Thomas, The Hideaway features a fully equipped kitchen with breakfast nook, tile floors, screened-in porch, a large outdoor patio with dining table, walk-in shower, and wonderful views of White Bay. Connected to the main structure, the first bedroom comes with its own private bathroom, king-sized bed, and walk-in shower. The second bedroom, also with its own private bathroom/shower and a queen-sized bed, is a few steps away under a covered deck and gives guests more privacy away from the main living area. The third bedroom has a queen-sized bed and sits just above the main structures in a stand-alone building and allows for total privacy or a place perfect for the kids. The beach is only a 5-minute walk through beautiful gardens and fruit trees. "This is the exact view we [were] captivated by for 9 days of absolute heaven! The staff at White Bay Villas are amazing helpful loving women! Love them all! ❤️ Look forward to visiting again the first of the year and WBV will definitely be the place for us! Outstanding Villas and staff is very attentive and understanding of what a guest needs and wants in a vacation of such a beautiful place!"